Last week I lost a very important lady-- my nana Iris passed away following a couple years of hospital stays and declining health. I credit my nana with my obsession with tea among other things (she moved across the pond in her 20's to be with my grandfather who she met while he was stationed in England). She used to pick me up every day from preschool and I spent countless hours at her house coloring, watching cartoons, feeding the neighbors horses (who ran to the fence when you whistled), and dunking Vienna Fingers cookies in hot tea fixed with milk and sugar. She had 5 children, 11 grandchildren, and 4 great-grandchildren-- who all adored her. *** After a very bittersweet week spent at home on Cape Cod with my family, I wanted to commemorate nana with some new ink. I did my research and found Studio 28, a tattoo studio that offers custom artwork and has a pristine reputation. 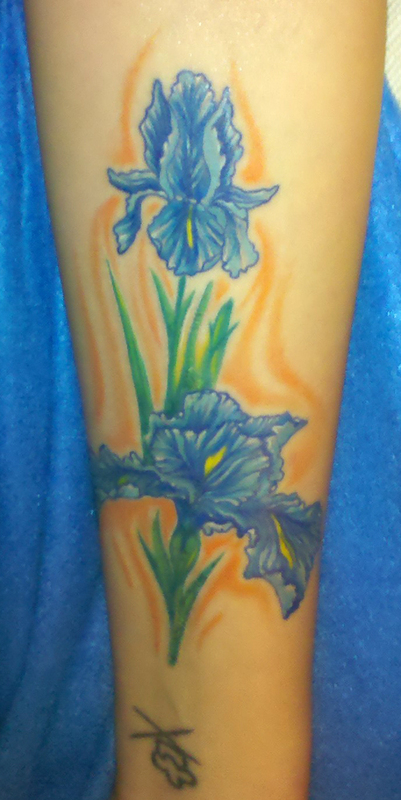 I brought a bunch of photos of irises to my consultation, and made an appointment for a few days later. Alex Alien did an *amazing* job on my tattoo! The details and colors are gorgeous-- I'm so happy with it! It's my 7th tattoo, but the first one that's really visible (it takes up my whole inner forearm, wrist to elbow). I can't wait for t-shirt weather so I can show it off!